Milagu Adai is made with Raw Rice, dals, crushed Pepper & cumin seeds.But i used Samai Rice (Little Millets) to make this Milagu Adai. 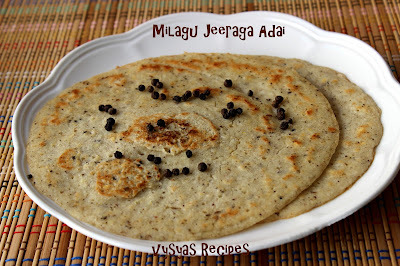 (other Names:Hindi: Kutki; Tamil: Samai; Telugu: Sama; Kannada: Same; Malayalam: Chama).Milagu Adai is a Special Recipe, made during Karthigai Deepam. I have used millets so it is healthy too.It is an Easy & Healthy break fast or Dinner Recipe.Crushed Cumin & Pepper Corns,when blended with Rice & dal's, tastes Good.Now we learn to make this Adai. Samai Rice - 2 cup. Pepper Corns - 2 tsp. Crush the Cumin seeds & Pepper corns to a coarse Powder. Soak Samai Rice,Poha,chana dal,Toor dal, in a needed water for 1 hour. Then Grind it, into a little coarse Paste, with needed water & Salt. Add Crushed Pepper corns + Jeera Powder.Add Grated Coconut.Mix well.Let the consistency be little thicker than Normal Dosa batter consistency. Heat the tawa, when it is hot take ladle full of batter, & spread lightly to make thick Adai. Drizzle some oil. Flip the Adai, when both sides are cooked Remove from tawa. 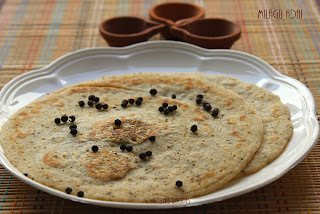 I used Little Millets(Samai) to make this Adai. you can use any other millets like Varagu,Thinai or kuthiraivali Rice. Adding Rice Gives softness to Adai. Instead of poha you can add one cup of cooked rice also. you can serve this adai with butter or Honey.